You can use our hosting services regardless of who you registered your domain with. All you have to do is login to your current registrar's website and change your nameservers to NS1.UNSHADOWED.NET and NS2.UNSHADOWED.NET. However, if you would like to transfer your domain(s) to us please follow the instructions below. First, login to your current registrar's website and locate the domain you wish to transfer. Check to see if it is locked and if it is follow their instructions to unlock it. Next, obtain the domain's EPP code (authorization code) from your current registrar. You may be able to directly view the code from their website or sometimes you need to select an option on their website for them to email it to you. Now that your domain is unlocked and you have the EPP code, you can begin the transfer process to Unshadowed. 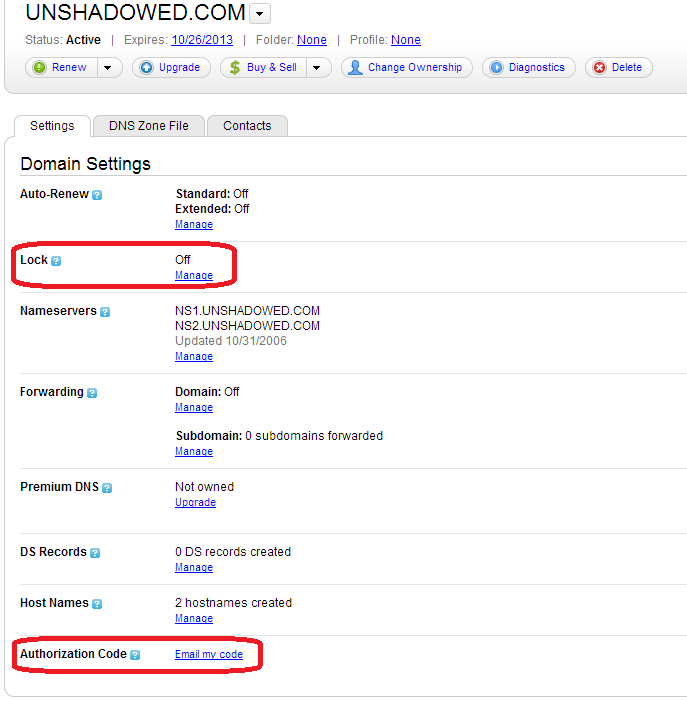 Go to www.unshadowed.net and enter the domain name you wish to transfer and click on the Transfer button. The system will check to make sure it's already registered and therefore can be transferred to us. Click the "click to continue" button to proceed. Next, enter the authorization code you obtained from your old registrar in the box provided. 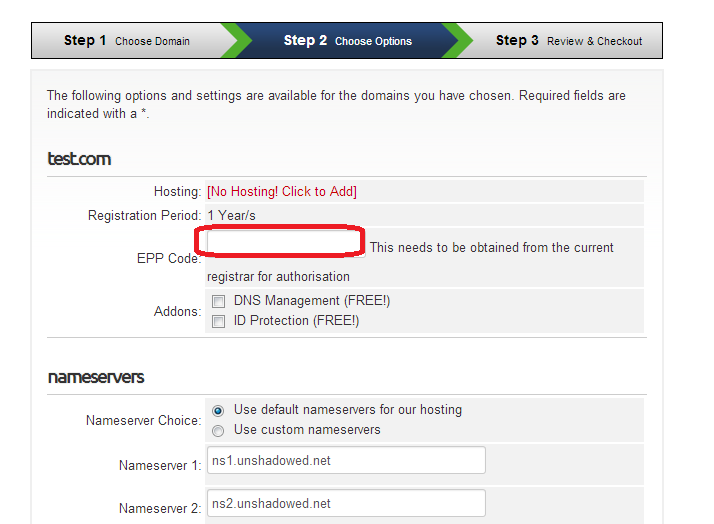 If you want free ID Mangement (domain privacy protection) or DNS management check the appropriate check boxes. Assuming you want to use Unshadowed for hosting, you can click on the "update cart" button to proceed. Otherwise if you want to host your domain elsewhere, choose the "use custom nameservers" option and enter the information for your host. In step 3 complete the checkout process. After you have paid for the transfer the administrative contact for your domain (most likely you set this to yourself) will receive an email requesting whether to approve or deny the transfer. Click the approve transfer link. If you receive a success message, your domain should transfer to Unshadowed within 5 days. If you receive an error please report it to Unshadowed. If everything has gone through succeessfully, your domain should be transferred to Unshadowed within 5 days. However, you can speed up this process by validating the request one more time with your old registrar. Some registars send a final approve / deny email, whereas others (i.e. 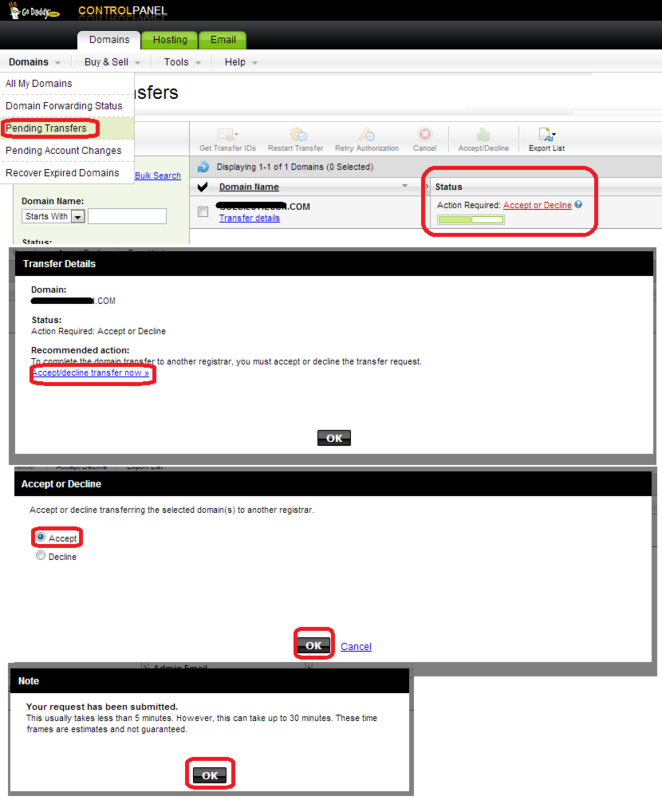 GoDaddy) allow you to confirm the transfer on their website. The process for GoDaddy is below. If you run into any trouble or have any questions or concerns please contact us right away.